This sermon was preached on February 8, 2015 at Winnetka Presbyterian Church. My text was Matthew 14:22-33. You can listen to it, and read it, below. The drawing above is something I drew for the kids to take home. We’d gone out a little further than we had planned. Jesus hadn’t given us much of a choice – he insisted that we get on the boat and head out onto the lake. Who knows where he went – but he said that he needed some time to be alone. And really, who could blame him? He’d just fed over 5,000 men, and probably another couple thousand women and children. And he had just heard the news that John the Baptist had been killed…beheaded no less. So, of course Jesus would need a little “Jesus time” after such a crazy few days. But still…this was a little bit further than we normally go out on the lake. …except for that wave…that was a huge one. The boat was really being tossed around, back and forth and…and where was Jesus? Now, he did have a habit of doing this sometimes…of just disappearing. Not really telling us where he was going. Or maybe he did tell us and we just missed it. We really do try but we don’t always understand everything that he says or does. So, we battled with the wind and the waves all through the night. We were all getting tired and exhausted, so we let each other take turns resting, as much as you could rest in a boat that’s being tossed this way and that by wind and waves. And we waited for Jesus – all the while, trying to keep the boat afloat. Night went on, the early morning came, and then…what was that? Someone said they saw something! It was hard to make out exactly what it was, because of all the wind and the waves|…but it looked like…well, we couldn’t tell. We all got up and were staring out on the lake…squinting our eyes, trying to figure out what it was. But all it looked like was…a kind of mysterious shape…a person maybe? We were terrified. Really. This was unlike anything we’d seen before. We really wished that Jesus had been there, right then, to protect us, and keep us safe. Don’t be afraid Jesus? Don’t be afraid? Well, it seems like you could have yelled that a bit earlier, when we all thought you were a ghost?! And then…well, then Peter did what Peter tends to always do…always trying to show us up a bit…he told Jesus to call him out onto the water if it was really him. And Jesus did what Jesus tends to always do…he told Peter to trust him and to come. Let me just say – this was insane. There we were…out in the lake…struggling to keep the boat afloat during which seemed like a big storm at the time…and Peter decides to take a step OUT of the boat. We all thought he was crazy – and begged him not to do it. We could see it was Jesus but we were going to take him at his word and stay in the security of our boat, relatively safe from the stormy waves. But he wouldn’t take our advice…and so he stepped out of the boat and…what?! He was walking?! On the water?!?! Like Jesus had just done? Amazing. We were all a bit sheepish and embarrassed that we hadn’t been the ones to take that first, initial, incredibly-difficult step out of the boat…but now it was even more clear to us who Jesus was. Sure, he wanted to see if Peter would take that step…but he was also right there for Peter, when he needed a little help. And Peter did need help. When Peter became more aware of his surroundings and the difficulties of his present situation…you know, like giant waves crashing around you and water beneath your feet? Instead of focusing his awareness on Jesus…he began to sink. But, like I said, Jesus was right there. He saved Peter, brought him back into the boat, and just like that…the wind settled down. Whatever had been unsettling the waters and wind and waves…and perhaps us too…had been calmed by the very presence of Jesus, the Christ. After witnessing such an amazing show of love and grace and power…it seemed that the only appropriate thing to do was to bow down and worship Jesus – acknowledging that he really must be God’s son. That felt right…not forced…simply an appropriate response to Jesus and to his amazing encounters with the people he fed and for saving us out on the water. Things were never quite the same for us and Jesus after that. That experience brought us closer to him, and allowed us to trust him more with our lives – because we knew that he had us – he was going to be there for us and immediately reach out and grab us. I wonder what it must have been like to be in the boat, out on the lake, watching…something…a figure…a ghost…walk out towards you? And then to see that it’s Jesus? And then to see one of your friends…take a step out of the boat and into the water? I can’t quite imagine it. As we reflect on this story today – I want to ask each of you, this morning, who you think you are in this story of Jesus walking on the water. Who are you? Do you relate to the frightened disciples in the boat? Do you relate to Peter, having the strength or faith to take a step out of the boat? Do you relate to one of the other disciples who thinks that Peter was just crazy for doing that? Now, I won’t go around and individually ask for your answer (well, I might as you’re on your way out of worship today)…but I think it’s something helpful to think about. So, who are you in our story this morning? Maybe you feel most like one of the disciples that stayed in the boat? I would suggest, that’s not a bad group to relate to in this story. First of all, they are disciples of Jesus. They have all, in their own ways, already made a commitment to drop everything and follow Jesus. So, while we like to make the disciples out to be bumbling idiots sometimes – following Jesus around, never understanding what he was talking about, not recognizing him as he walked toward them in a storm…we have to keep in mind that they DID already leave their previous lives to commit to Jesus and follow him. So, to feel like one of the disciples who was in the boat – that’s not a bad thing. I’m sure many of us probably relate to those disciples. Peter certainly has his ups and downs. A few chapters later, we’ll see Jesus commending Peter for his faith and telling him that Jesus would build his church on Peter, the rock. It is also Peter who, at the Last Supper, first tells Jesus that there is NO WAY that Jesus will EVER wash his feet, and then in the next verse, he cries out “Lord, wash my feet, and my hands, and my head and…well, wash ALL of me!” And then…a few verses later, we see Peter denying Jesus, not once, not twice, but three times. Now – can’t we all relate to Peter? Don’t we all have moments when we are ready to serve God and fully commit our lives to God, and then other moments when we deny even knowing God or following Jesus? I love people like Peter in the Bible. I think they make the idea of faith and following Christ much more realistic, more messy and yet, more doable. 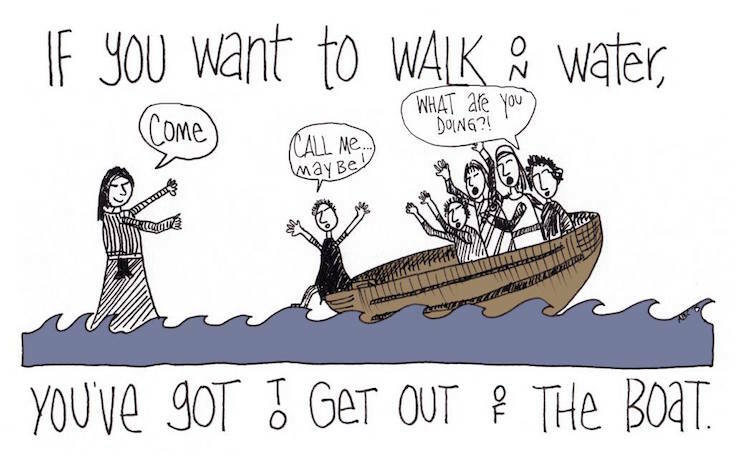 Jesus says, “Come” and Peter takes that first step out of the boat. And it’s really the first step that I think is so amazing. What Peter left behind, with that first step, was everything that he knew and was familiar with. He left behind a sturdy boat. Granted, it was being tossed and turned by the waves and the wind, but still…it was what he knew. He knew solid ground. He knew the boat. What he didn’t know was walking on water. So he left behind all that was known and comforting and safe. He also left behind the other disciples. He knew that he needed to take this step, begin this journey, make the first move, whether the others were ready to or not. Now, he didn’t berate them for not having as much faith as he had, and didn’t mock them for being afraid…none of that. But he wasn’t afraid to leave them to try this new thing, this walking-on-water thing. And he knew that while he was leaving them behind, leaving them to turn to this new adventure…he was also turning towards Jesus, and that couldn’t be a bad thing. So he left behind all that was known and comforting and safe, and he left behind his friends, the other disciples, and turned toward Jesus and something new. I think he also left behind reason – I’m not sure if that’s the exact word I want, but you know that there had to have been a part of Peter that was saying things like “This doesn’t make any sense – this isn’t rational – YOU CAN’T DO THIS” as he began to lift his foot up to take that step. Of course it didn’t make any sense. Walking on water? Who does that? I think it was perhaps a lack of imagination that he left behind. In order for Peter to be able to fully trust Jesus and step out of the boat and walk on water – he had to either leave behind, or quiet that part of himself that was reason or rational thinking and instead, he had to stir up his imagination and trust that this was going to work out. And then…he did it. He stepped out of the boat. It probably surprised Peter as much as it did the other disciples (and maybe Jesus too), but he was doing it! He was walking on the water. The text tells us that “Peter got out of the boat and was walking on the water toward Jesus.” It doesn’t tell us whether he took one step, or 101 steps. Just that he was walking on the water toward Jesus. And then he began to sink. We are told that Peter noticed the strong wind, and began to sink. We could say that he took his eyes off of Jesus, or perhaps his focus and awareness shifted to his surroundings instead of being focused on Jesus, or he allowed fear to creep back in, even though Jesus had instructed him and the others to not be afraid…whatever the reason, he began to sink. And yet, as he began to sink, Jesus was right there. Jesus reached out immediately and grabbed him. Jesus is there – ready in case something goes wrong – and he’s ready to make sure that Peter is kept safe. Jesus says to Peter, “You man of weak faith! Why did you begin to have doubts?” Often, we tend to read that as a scolding by Jesus, or at the very least, some mild disappointment on the part of Jesus. And I suppose you could read it that way – but I like to think of it differently. These were guys who spent a lot of time together, and probably joked around, gave each other a hard time…so I like to think it sounded more like, “Dude! You had it man…why did you start doubting? You totally had it – you were walking on water like me! That was awesome – just don’t start doubting next time.” I think it was almost more of an affirmation that Peter had taken the right step, that Peter had really done it – he just needed to not be afraid next time. I love that idea of Jesus “immediately” grabbing him. Jesus wasn’t going to let him flounder or start to really become terrified. Jesus was right there. Ready to be there for him. It’s a pretty simple quote – and it’s obviously true. Had Peter never taken that first step, had Peter never stirred his imagination and decided to trust God, he never would have taken that first step, he never would have walked on water, and he never would have known what a thrill it was to do so. Where are the places in your life where you need to get out of the boat? Do you find them on your spiritual journey? Your relationship with God? Are you ready to go to new places with your faith, but…not exactly sure how to do that? Have you been sitting in the boat, unsure of what will come next? Where else in your life do you need to get out of the boat? What about your your job or career? Your relationship with your partner or someone else close to you? Have you been waiting, and waiting…and just aren’t sure that you want to take that first step out of the boat? Where are the places in the life of Winnetka Presbyterian Church where we need to stir up our imagination and just take that first step to get out of the boat? Do we find those places in our stewardship campaign? What about our children’s or youth ministries? What about the ways we serve God and share God’s love in the world through mission? Are we sitting in the boat, watching the wind and the waves come crashing down around us, rocking our boat, and perhaps we are fearful of what’s next? God wants us in the arena, in the water. God wants us to take that first step. To step out of the boat. We might even walk on water a bit. Or we might immediately sink. Yes, we are going to succeed and yes, we are going to fail. Either way, God is right there. Ready to immediately reach out and grab us.